← What is the first resurrection? What is the second resurrection? THE CHILDREN OFAdam and Eve lived to be very old. Their children also lived for several hundreds of years. And so it was that grandsons became grandfathers before their own grandfathers died. Thus several generations lived and worked together. After a while there were many people living in the world. We do not know very much about those people of long ago except the fact that many of them were very wicked. Among them was one man, however, who, like Abel, tried to please God. This man’s name was Enoch. The Bible tells us that Enoch walked with God. We understand that he loved God better than he loved anything else, and talked to God and listened when God talked to him. Finally Enoch became an old man. At last, when he was three hundred and sixty-five years old, one day God took him away from earth to heaven, and he did not die. Enoch had a son whom he named Methuselah. This man lived for nine hundred and sixty-nine years, until he was older than any other man had ever been. Then he died, like all other people had done except his father Enoch. 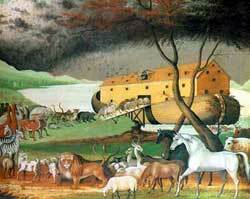 Now Noah believed that the time had come when he might uncover the roof and look out upon the earth. How glad he must have been to see dry land again; for more than a year had passed since God had shut them inside the ark. And God said to him, “Come out of the ark, with your wife and your sons and their wives, and every living thing that is with you in the ark.” So Noah opened the great door, and he and his family stepped out upon the dry ground. All the animals and the birds and the creeping things came out also, and began to live upon the earth as they had done before the flood. God then promised that never again would he send another flood to destroy every living creature, and that as long as the earth should remain there would be summer and winter, springtime and autumn, and day and night. And because God wanted mankind to remember always the promise that he would never again destroy the earth with a flood, he placed in the sky a sign of his promise. That sign was a beautiful rainbow. Have you ever seen that rainbow-sign? It is God’s promise to all mankind-to you and to me as well as to Noah and his children. This entry was posted in Discipleship and tagged Adam and Eve, Book of Genesis, Christ, Christ Jesus, Christianity, Jesus Christ, theology. Bookmark the permalink.